Updated 4/29: head to the bottom of this post to see who did and didn’t get into the semi-finals! As you may have already read, we submitted a project to the Knight News Challenge to amplify, archive and create a community around social change memes. (More about that on our project application.) Since this is our first experience with the Knight News Challenge, we couldn’t help but wonder: what other projects are out there? Naturally, applications from some of our friends and supporters, like Personal Democracy Media’s new Personal Democracy Center, Free Press’s TechDefender and Open Internet Lab, ROFLCon co-founder Tim Hwang’s Peak Advertising Institute and Meedan’s Checkdesk1 caught our attention. EFF’s OnlineCensorship.org and Toonistan, a citizen cartoon generator from Iran were noteworthy submissions as well. But with 663 applications, we were curious about what else was out there. Before diving into the details, let us clarify what you’re looking at here. arts = arts performance or work. There weren’t many of these. community = organizing, training and persuading people, rather than building something. Includes supporting non-profit organizations and campaigning for a bill to be passed. content/resource = building a content site or online community resource center. Usually these projects have elements of community outreach/submission, and some minor tools (see below). Includes building or expanding news sites. data viz/storytelling = building or applying data visualization tools for better storytelling. We created this category when we realized that there were quite a number of tightly-focused, data visualization projects. game = building a game or “gamified” platform. Includes educational games and social networks focused on gamificiation. mesh network = building a local, “off-the-grid” community internet network. Again, we created this when we realized how many of these there were. Often mesh network projects include an element of local information sharing. open data = both the evangelizing and tool building for the open data movement. Includes both encouraging people to release open data to building platforms to host them. security/privacy = initiatives or tools to better secure the internet or the privacy of its citizens. Includes secure email or messaging platforms, but we’ve excluded platforms for personal data that feel more anti-commercialism than pro-privacy. research = a typical research grant where a group of people go out and investigate a topic with the funds. tool = building a tool for consumers or other engineers. This is probably our most ambiguous category, as tools take many forms. Includes mobile reporting tools, social networks and backend technology protocols. Kids/teens = anything for kids, teens, parents and schools. Higher education not included. Regional = targeting a specific country, region or city. Have not included any that target the entire US because it’s a very blurry line between national US and global (unfortunately). Women = specifically for or about women and girls. In the above categorizations, we often had to make judgment calls on whether a project is, for example, a tool or a content/resource. Please assume a margin of error in the our findings accordingly. The three dominating categories on the first chart (content/resource, community and tools) are no surprise. Given that the Knight Foundation often funds technology and/or journalistic projects, it only makes sense that many people are submitting projects for news sites, tools to improve discourse/reporting/civic participation and building capacity in pro-internet-freedom organizations. The surprise lay in the smaller, mid-sized categories that emerged. Open data, security/privacy, mesh networks and data viz/storytelling all started off as subsets of the three main categories before we realized that there was a critical mass of them to splinter off. These would be what we might consider the “trends” of the Knight News Challenge: specific themes that have coalesced in response to the latest news (NSA leaks) or technological developments (maturity of core technology). From the second chart, we were surprised how many projects specifically targeted the next generation (kids/teens) and how many were local or regional projects. It’ll be interesting to see how much emphasis the Knight Foundation decides to place on both of these groups. Local news needs a business model. There were dozens of projects to pilot or grow local news outlets into sustainable businesses across the country. Local civic participation wanted. There were also a dozen or so projects related to finding out about local policies and politicians, and to engage citizens to do more. On-the-ground reporting tools galore. There were dozens of web/mobile projects to connect on-the-ground citizens to journalists so that they could dispatch the latest updates to them. Secure email and messaging. There were four separate secure email solutions, and three secure instant/mobile messaging projects. Service on top a service or browser plug-ins. There were quite a few projects that involved creating an additional layer on top of our regular internet experience, whether it’s for commenting or fact-checking. Personal data platforms. There were probably a dozen personal data platforms, ranging from places to store consumer or internet browsing data to your personal healthcare records. People want better commenting and discourse on the web. There were more than a few projects that aimed to fix comments or allow for bi-partisan political discussion. They assumed that once it was built, people would come. A crowdsourced solution will give us the right solution. Plenty of idealism sprang up around having a crowd develop the perfect solution for a political or humanitarian problem. People aren’t getting the news they want. Many projects assumed that readers were not getting the right mix of local/political news in their media diet, and that people would sign up for a new service to give them what they want. Overall, it was encouraging to see so much great energy around topics and issues we’re also passionate about: creating more discourse, crowdsourcing solutions, diversifying the news. None of these are magic bullets, of course, but we suspect they can help lead the way to a more free internet and stronger journalism for the 21st century. Update: Who got into the semi-finals? The Knight Foundation publicly announced the semifinalists last Friday and, as with the entrants during the last round, publicly listed them on the News Challenge website. 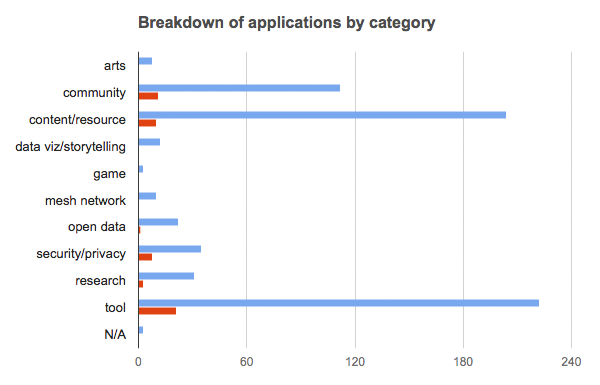 Security/privacy was the big winner in terms of number of accepted versus number of applications. There were, for example, two semifinalists who offered more-secure email solutions. Tools and community were more or less equally likely to be funded, whereas content/resource applications were only half as likely. Mesh network and data viz/storytelling has zero semifinalists; we suspect these aren’t priorities for the foundation. Open data only had one semifinalist, though due to our categorization scheme, there were probably quite a few applications that included open data that ended up in the security/privacy category. The two Kids/teens semifinalists focus on parenting and school work. The two Regional semifinalists focus on India and Eastern Europe respectively. Stay tuned as Knight announces its finalists and we track who makes it to the finishing line!